Travel is freedom… one of the last great sources of legal adventure. Travel is intensified living, with maximum thrills per minute. It’s recess, and we need it. Part of bicycle travel is about the bike – about riding, self-propelled through the countryside, and feeling the wind in one’s hair. Another aspect of being on 2 wheels is pauses along the way to experience a museum, a cemetery, or a magnificent cathedral. Or, merely sit quietly by the side of a river, contemplating the flow of the universe. Last year, based on an offering by our favorite yoga teacher, we tried a new first: a yoga retreat. With travel: a retreat on the Pacific coast of Panama. This year, we would try another yoga retreat in a new location: Iceland. In an effort to combine several opportunities into one massive fun vacation, we decided to bound our Yoga Retreat in Iceland with RV travel. Partly, this was the result of discovering that relatively inexpensive travel to Iceland on WOW Airlines originated at the BWI airport. Baltimore being the closest city to Atlanta to catch a WOW flight. A brilliant plan, on a conceptual level. However, this Yoga Retreat (my naive hopes reconfigured) was, in its full-bodied reality, a Yoga Adventure! And, without much effort, RV travel can also become an Adventure. In retrospect, why both Adventures? Together? Without a restful break in between? In fact, we older folks view “recess” as a time for gentle reflection – not a time to run full speed in an unfamiliar environment. Within the world of travel, many tour companies provide a pre-packaged experience. (e.g. a Yoga Adventure) Naturally, the personal reactions of each traveler will be unique – but, the overall schedule is in the hands of The Tour. Usually, one’s fellow travelers are compatible people who have purchased the same experience. They may be nice people. They may enhance experiences by sharing their perspectives on the Grand Masters… But, as we all know, it only takes one truly rude and selfish person to completely sabotage synergistic enthusiasm. For example, I had a lovely solo visit to The Mariners’ Museum in Newport News, VA. Quite small (compared to really well known museums). And, delightfully uncrowded. Pacing by a solo visitor can reflect personal interests and evoked curiosity. The process of thoughtful interaction with displays of art, technology and the instruments of naval warfare, had been quite intimate. Upon my return from my gentle adventure, I enjoyed sharing the experience with my wife. And, surprising perspectives can appear. At its best, for me, travel is educational. It provides new information. It redefines existing knowledge with extensions to what is already know. It enhances understanding. And, in an age of truthiness, it can be a corrective for inaccurate facts and divisive misunderstandings. Travel by a couple (or, solo travel) requires planning. That exercise is often a catalyst for inquiry into the essential question: Why Travel. What conceptual goals (intensified living? universal truths revealed by a different cultures? escape from the tedium of work?) are the key objectives? However, if the itinerary is in your own hands, the planning challenges are unavoidable. All the Who What When Where How question become relentless. And, contingency plans (“Yipes, the weather has gotten even worse!”) require more exploration of options. But, you have total flexibility. (“Let’s spend another week in this charming Airbnb”) Of course, the unintended consequences of changes to schedules may have wide ranging impacts. After our discovery that relatively inexpensive travel to Iceland on WOW Airlines originated in BWI airport near DC, we formulated the Great Combined Travel Adventure. Ah Ha, we said. We can visit friends as we head north through the mountains with our RV, park the RV in the driveway of friends in Virginia, spend time with relatives in DC, and take Amtrak to BWI. 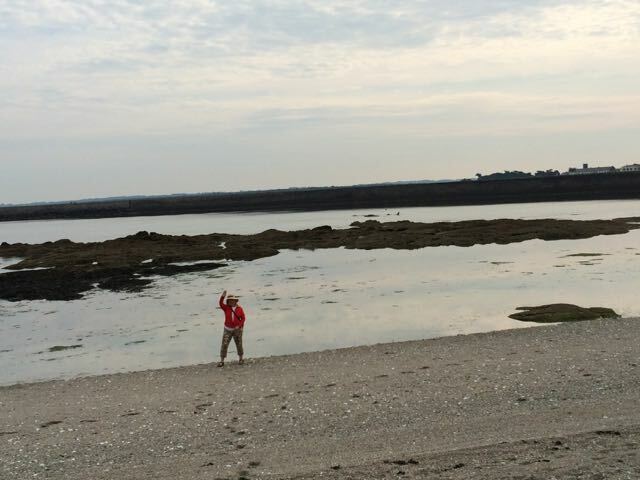 On our return, we can wend our way home along the coast after a restorative week of yoga. In a sense, the plan was rational. 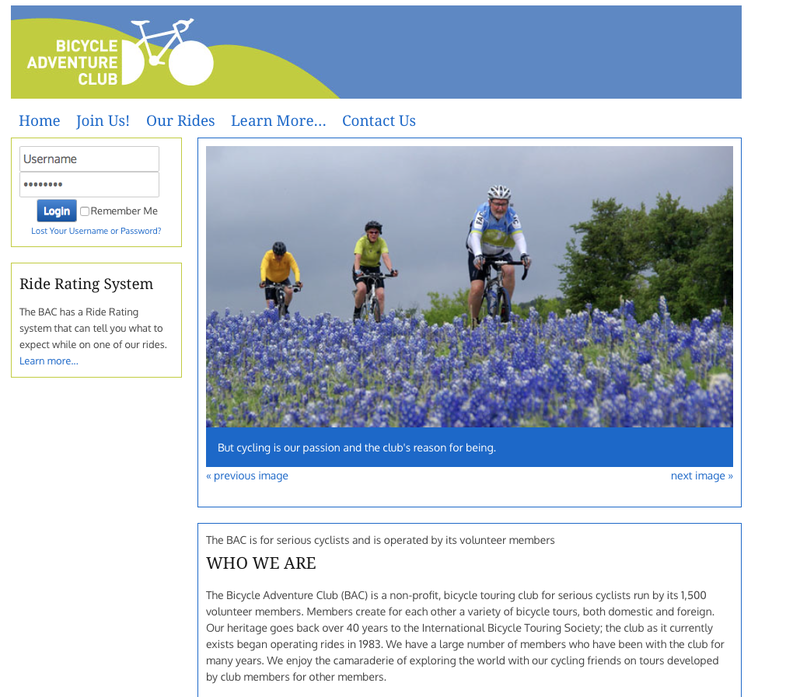 We could continue to deepen our RV skills without adding the bicycle component. We would have a chance to visit several wonderful people. We would experience diverse aspect of RV travel in the South (State Parks, KOA, Bubba’s RV Pit Stop… + mountains and seashore…) We could visit museums in DC, and more! At least 7 more exciting things! Including taking the RV on an ocean-going ferry. We visited friends and relatives. What is it like to restart one’s life in a new city without the baggage of a dysfunctional marriage? What is the reality of a high-end DC couple with exciting careers and high ambition? What is the reality of a traditional Virginia deep-state couple with one career and retirement in sight? Who would go on a Yoga Adventure? And why? New culture: Iceland, once a colony of Denmark is not exactly European, but certainly not part of the new world, despite the intersection (separation) of the continental plates. Great food. For those of us who love lamb and just-off-the-boat fish, Iceland is the promised land. Good weather – until it was gone. Easy RV travel: little rain for first week. (whew!) Only a few drops of rain in Iceland until the last day of hiking. Then, quite cold and wet. Listening to a free meditation: Deepak & Oprah discuss desire as OK (if it’s in pursuit of one’s true destiny). Listening to an audio book: The Swerve: How the World Became Modern – (Stephen Greenblatt) discusses Epicureanism, as defined by Lucretius: OK++ (if it’s not just hedonism). Note: both audio sources give no credit (Greenblatt) or little credit (Deepak & Oprah) to organized religion. In fact, secular humanism (Greenblatt) and ephemeral spiritual effulgences (Deepak & Oprah) seem to be the catalysts for the effective progress of civilization. Navigation in the world of bicycle travel is challenging. [link!] Navigation for RV travel has its own moments of difficulty. Driving into any gas station in a car makes perfect sense: gas stations were designed for cars. Duh! However, the original design of the average gas station did not include a vehicle towing a 19 foot trailer. A trailer much taller than the car. (Full height of our “Winnebago Micro Minnie” – 9’ 7”) Careful inspection of the scope of gas station areas has prevented a disaster, so far. As a general rule, phone-based GPS systems work well. However, not every area in rural America has good (read: AT&T) mobile phone coverage. The iPhone’s navigation does poorly when out of contact with the Mother Ship. And, in rural South Carolina, road improvements can result in just enough displacement to imply that one is off the correct road. However, Iceland had 31 days of rain in May. Too much. Coastal North Carolina (Outer Banks) greeted us with flooded roads. Fun to pilot an RV through an ad hoc swamp? No. But, if serious disasters are to be avoided, civic responsibility requires bringing near-disasters to the attention of people who can improve safety procedures. So, a chat with the person at the ticket counter in the station. “On Monday, call this number, and ask to speak to Customer Relations,” she said. Apparently customer relations is not a needed function on weekends. But, we were off to Iceland in a few hours, and an international call to a 1-800 number (with a voice menu system and musical hold delays) seemed a task that was best done in writing when back in the USA. Travel can be exciting and invigorating. It can also be too exciting. Some of us contemplative types call that stress. And, the more complex the travel becomes, the more likely excessive invigoration will sour into rancid chaos. Exhaustion and illness often follow. But, Bad News is merely a footnote if one returns with good memories, amusing stories, and an appreciation for new ideas and perspectives. At the start of this blog entry, I mentioned the purposes of travel: “to develop a better understanding of our world” and “to experience great art, music, history, food, and people”. Of course, a “better understanding of our world” often includes a deeper understanding of ourselves. We appear in a new context; we imagine who we might have been in an earlier age; we contemplate the ebb and flow of civilizations. In its most general sense, a “retreat” means a quiet or secluded place in which one can rest and relax. In a religious sense, a “retreat” means a period of seclusion for the purposes of prayer and meditation. Although yoga, in its Western spandex-clad aerobic incarnation is no longer a religion per se, I have sometimes referred to inspired yoga teachers as acolytes of the Church of The Sticky Mat. Indeed, one of the reasons for our 2017 Yoga Retreat to Panama was the spiritual nature of the yoga instructor, the trip organizer. Her classes are a reminder that, at its best, the world of the body, the mind and the spirit all harmonize with the same universal laws. And, she was the instructor / leader of our Yoga Adventure in Iceland. As a noun, “adventure” means daring and exciting activity calling for enterprise and enthusiasm. But its first meaning also has implications of engaging in hazardous activity, especially the exploration of unknown territory. Even to put one’s life at risk. Iceland is not an unknown world. However, incessant stimulation (yoga classes, frenetic bus travel, incessant conversations, long kikes in the overgrown lava fields…) can easily transmute a retreat into an all-too-exciting adventure. 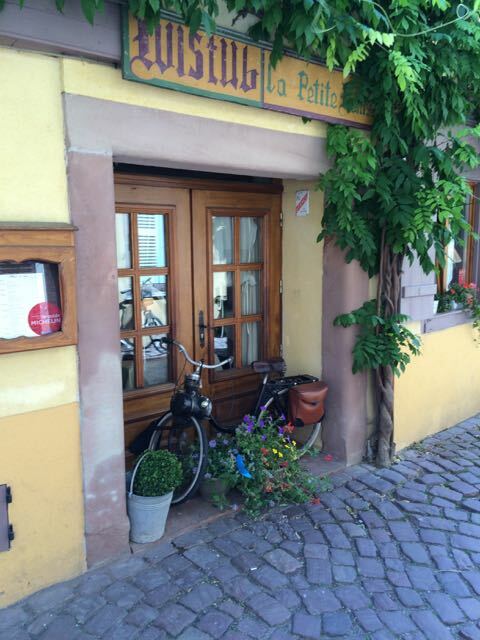 The entries in this blog since its start (2012) have been about European bike travel. That focus has enabled not only comments on bike travel itself, but also reflections on the layers of culture that motivate much European tourism. Travels in Europe, often informed by prior understandings of history, augmented by thoughtful comments from guides, and enriched by conversations along the way, illuminate the trajectories of some of mankind’s extraordinary developments. Beyond the hypothesis of Guns, Germs and Steel by Jared Diamond, there is a complex and subtle flow of ideas of progress, examples of regression, monumental accomplishments, horrific periods of repression… A panoply of experiences: great art, music, history, food, and people across centuries. In European Bicycle Adventure Club travel there is no need for audio books; no time when stuffing MP3-connected earplugs into one’s ears makes sense. But, in RV travel, when one is on the move, it is possible to connect an iPod or iPhone to the speaker system of the tow vehicle. Then, a travelling couple can listen to and comment on an audio book that illuminates aspects of European progress or a web-hosted mediation on the best way realize one’s dreams. Suddenly, despite our physical location in the mud puddles of coastal North Carolina, we were exploring other worlds. In the case of Oprah and Deepak, we transitioned into the world’s wisdom traditions with a pervasive assumption about the inherent goodness of each person – and the beneficent splendor of our desires. In the case of Stephen Greenblatt, we had a more nuanced view of human nature – and persuasive arguments chronicling ideas that influence the course of history. Views of the universe defined without support from a specific religion. Indeed, Greenblatt’s central argument explaining “The Nature of Things (De Reum Natura)”, a poem by Lucretius, is that the next world, the world of the Roman Gods (or, by implication), the God of the Judeo-Christian tradition, does not exist. We are merely atoms. Interesting collections of matter, combined at a point in time to form beings that eat, experience attraction, and procreate. Therefore, our highest good is pleasure. The authorities of the ecclesiastical world have opposed this heresy since Lucretius created his masterpiece in the time before Christ. In the centuries since its rediscovery by Poggio at the start of the Renaissance, paroxysms of book burning have included this volume. As the The Swerve progressed in its wide-ranging observations on the impact of new ideas, it jogged a vague memory of Girolamo Savonarola’s fanatical excesses to suppress hedonistic behavior. I had forgotten (if I ever really knew) that his religious fanaticism occurred in Florence, the epicenter of the Renaissance. How, I asked, could the best educated population of Europe – the supporters of scientific exploration and artistic excellence – endorse a rabid priest who advocated the destruction of the accomplishments of a civilized world? Clearly, the nuanced layers of Europe’s civilizations – whether experienced directly on 2 wheels or experienced vicariously through brilliant observations – have relevance to a deeper understanding of our world and of ourselves. Soon, more travels on 12 wheels. And, eventually, back to Europe for more exploration and reflection. The previous post concluded with comments about the last rider along the canal – a European cyclist who would want fresh bread at the start of each day. 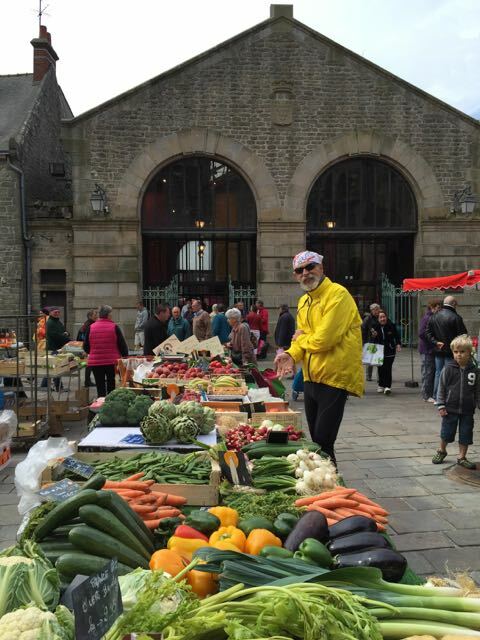 We all want a long ride – good food every day, wonderful friends… But as we left Tournai, it was clear that our two-week ride was nearing its final stage. As we continued into Belgium, we were leaving the land of “wine culture.” We had entered the region of “beer culture.” What would be a more natural celebration than a beer tasting on our barge one evening? And, which crew member would be the natural presenter of an historical perspective of traditions of beer which go back to fermented fruit juice? (Yes, there is cherry beer!) The choice was the engineer, Michael, who was in charge of all things mechanical, and who shared pilot duties with the captain. Like everyone on board, his education was broad and deep. And, his respect for the traditions of food and drink was clear. At our stop in Ghent we found not only local beers, but a perspective on Europe’s ongoing efforts to merge the old and the modern. Part of this challenge is transportation: pedestrians and bikes with cars and trams. Another part of the challenge is in the area of architecture. Integration of Renaissance / Gothic with functional modern. Of course no visit to a European city is complete without visits to the twin monuments of historic urban life: a cathedral (architecture of worship) and military technology (architecture of warfare). 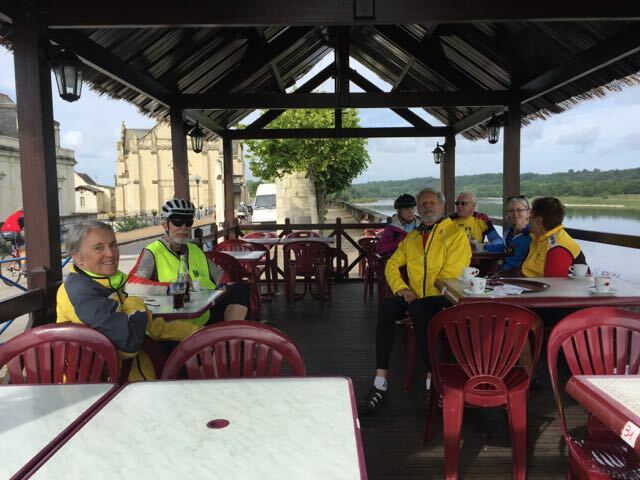 Our ride was unusually swift and gentle – a quick stop at a rural cafe for coffee and a mid-morning croissant. We cycled past many fields of placid cows that seemed to be posing for pictures of bucolic boredom. Even Vincent Van Gogh would have had difficulty finding aesthetic substance in such a bland swath of farmland. Before our lunch stop, we reached Bruges – and, our arrival was a form of celebration: a two-wheeled, two-week journey completed. A short stop for a picture of our 3 leaders: Christan, one bike leader; Birgit, our BAC leader; Ilaria, our other bike leader. We had time to hear a history of Bruges from Christan – and, tour a few shops. Yes, a once vibrant “Venice of the North,” has become a well-appointed nouveau shopping city for tourists. It survived a period of suspended animation from about 1500, when the river to the sea silted in, to its post-World War II status as a well-preserved artifact of early Renaissance Europe. Bruges – Golden Age: (12th to 15th centuries): As commerce increased from the river, and as canals were built, a city inside fortified walls was constructed. The street plan of the inner city remains the same to this day. The Bourse opened in 1309 (most likely the first stock exchange in the world) and developed into the most sophisticated money market of the Low Countries in the 14th century. In the last half of the 19th century, Bruges became one of the world’s first tourist destinations attracting wealthy British and French tourists. The historic city center is now a prominent World Heritage Site of UNESCO. 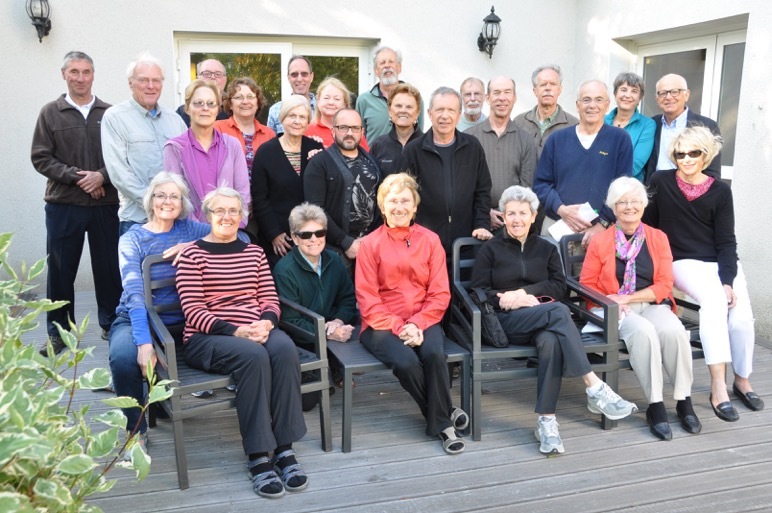 After our personal tour and shopping, we returned to the Zwaantje for our last supper; A special meal savored with great camaraderie and several toasts to a group that had developed the rapport of a close-knit family. Joy and I decided that we might never return to Bruges. Given its significance and charm, extra days seemed sensible. How could we leave this enchanting city without sampling its well-deserved culinary reputation: moules et frites and chocolate? A little more tasting of everything, including beer. One variant of the story of the sculpture’s arrival in Bruges is that the Pope, for whom the statue was created, found it too evocative of human physicality – too ambiguous in its spiritual essence. Not appropriate for display within the Vatican. Like many creative geniuses, Michelangelo may have tried to reconcile the theology of his day with an innate sense of how human beings relate to metaphysical reality. The Madonna appears lost in deep contemplation of the fate of her unique child. A young Jesus seems, although fully human, engaged by his burgeoning awareness of a special role. An extraordinary artistic blessing for Bruges. In the 20th Century, artists have turned from a celebration of the nature of the divine to a depiction of the horror of man’s inhumanity to man (perhaps with a scriptural assist). In central Bruges is a set of evocative modern sculptures: The Four Horsemen of the Apocalypse, created by Rik Poot. While in Bruges, we decided to do one last ride. There is something to be said for “Bike Tours” of any European city. There is always a guide with extraordinary knowledge of the city and extensive insight into its culture. There are invariably shortcuts that lead to hidden treasures. And, without fail, there is the stop for refreshment. “Ah,” I thought. A true Amsterdam woman – riding a bike on cobblestones when 8+ months pregnant. Based on the delays in creating Blog entries, it is clear that – for me – writing about travel is not a real-time effort. As I age, travel is more interesting, but takes more time in planning and in reflection. Reflection discloses themes in life – both individual and collective. For this journey, one of the poignant themes was Van Gogh. From an inspirational visit to the Van Gogh Museum in Amsterdam, to his gravesite in ⁨Auvers-sur-Oise⁩, ⁨to the many vistas along the bike paths that evoked his vision of a rural life of dignified struggle, his unique embellishments of color and form seemed to follow us and imbue every new encounter with an impressionistic light. My sense is that Van Gogh’s journey was one of self-discovery – a struggle, heroic in astonishing ways, to use a two-dimensional canvas to expose the vast and transitory reality that is the vibrating essence of life itself. His crossing into a world of imagination is able inform our explorations – journeys that have lasted much longer than his own. Official report of the Paris to Bruges trip: BAC_write_up. “Tripsite is your comprehensive marketplace for cycling holidays in Europe, Asia & beyond, showcasing hundreds of tours for the discerning cyclist, including bike and boat tours, bike tours, and multi-adventure tours! Offering a diverse portfolio, there are tours to fit any budget, from luxury to value and tours to suit any interest including history, culture, and gastronomy. Tailored made tours are possible as well! The “Zwaantje” (little Swan) is a fully converted passenger barge under Dutch flag and management with a length of 40 meters (131 ft.) that can accommodate 24 passengers. On lower deck the barge has 12 sleeping cabins: 10 twin cabins with two single beds each and two cabins with a double (French) bed. 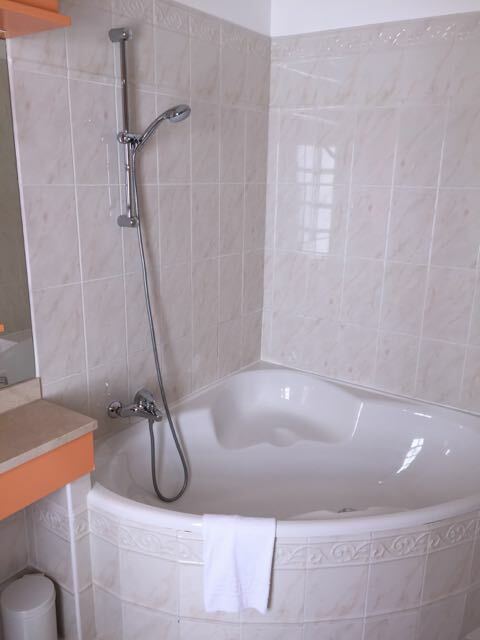 All cabins have a small en-suite bathroom with toilet, shower and wash basin, a fixed window (both double cabins have larger windows that also open) and individual air conditioning. The previous post ended with comments about Barge Navigation. It also included comments on the Compiègne Armistice Memorial. Indeed, the itinerary of our Paris to Bruges journey could not avoid constant efforts to comprehend more fully both the Great War and the subsequent conflict. Having started the trip to Europe with an arrival in Amsterdam – including a visit to the Anne Frank House – awareness of European battlefields was inescapable. But, of course, there is more to travel than recognition of man’s inhumanity to man. A constant theme of European travel is the relentless endeavor to construct Christian edifices. They were central to the life of every city. In ⁨Chiry-Ourscamp⁩ we found both the skeletons of abandoned houses of worship and also vibrant places of contemporary religious observance – evocative reminders of an age of faith. In Saint-Christ-Briost⁩ we found an unexpected spot of interest: neither war nor worship, but a lovely fish hatchery with a restaurant. Both local wines and local beers. And, more navigation choices. Most of us do not drink during a ride – but this ride was different. Unlike the usual 50 kilometer rides, we encountered a truncated / extended option. Remember the Barge Navigation post – canal traffic? Canal delays had caused shorter barge travel and a nearer destination for the night. So, the options were: eat, drink local beers and walk by serene lakes filled with fish; or, grab a quick bite of food and ride an extra loop into the hills. Below is an image of a serene lake. The following day was a Rest Day. Why, a non-bike rider might ask, a Day of Rest? 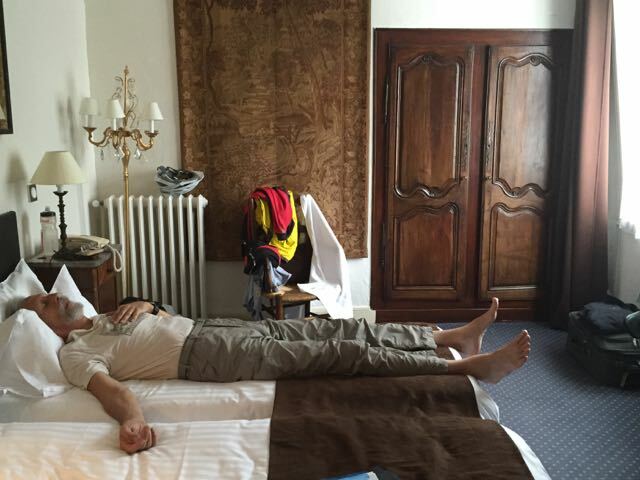 Several reasons: a break for the crew of the barge; a time to let tired legs heal (even the Tour de France has rest days); more importantly – do laundry in a genuine Laundromat. Our rest day town was Péronne: a collection of fine restaurants (remember: a day of rest / no cooking for the crew); and a stellar Laundromat. Since Péronne is in the area of the Battles of the Somme, it has an extraordinary Museum of the Great War. The museum employed an innovative format to display the uniforms and the kits (weapons and accessories) of the soldiers of the various armies (French, German, British, American, Australian…). Instead of a vertical manikin dressed in a specific uniform, there were rectangular depressions in the floor containing uniforms with guns, writing implements, food containers, .… It was as if someone had exhumed not bodies – but, the artifacts of soldiers. A display that recalled shallow graves. Looking down upon the empty uniforms of soldiers from 100 ears ago was as evocative as witnessing a field of crosses. Although, as a general rule, bicycle travel is much more common and much safer in Europe than in the United States, all bike travel is a transportation retrofit. Cities and road systems were designed to support pedestrians and horse-drawn conveyances. Bike riders are not pedestrians. Nor, are we able to compete in terms of speed and effectiveness with vehicles. Much two-wheeled travel is recreational, not dependable transportation. On this trip we encountered everything. Several riders noted that despite the relatively short daily distances (50 kilometers) and relatively flat terrain, there should have been a footnote expressing the need for technical skills. That is, single-track mountain biking techniques and curb jumping prowess for urban transitions. One form of surface is unique to Europe: cobblestones. Riding on this unique surface is recognized as a separate and highly regarded ability. 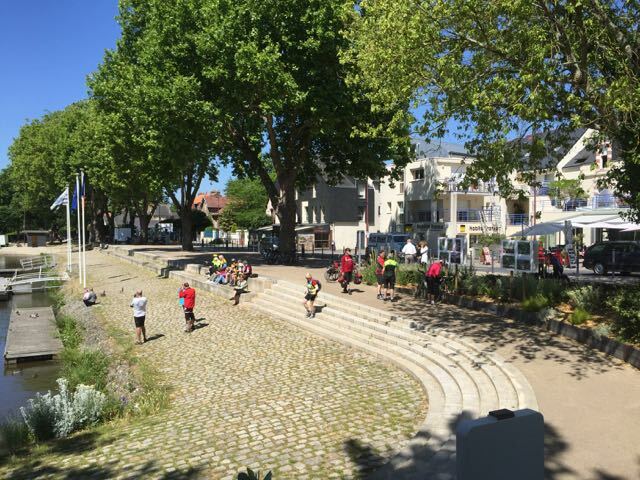 We encountered the signature event that celebrates this quixotic endeavor: an 85 kilometer race on cobblestones. The Paris–Roubaix is a one-day professional men’s bicycle road race in northern France, starting north of Paris and finishing in Roubaix, at the border with Belgium. It is one of cycling’s oldest races, and is one of the ‘Monuments’ or classics of the European calendar, and contributes points towards the UCI World Ranking. Even without bouncing on cobblestones, bike-and-barge life can be difficult. The illness that made its way through the group continued. Some of the ill folks recovered and went back on the road. Some folks who appeared invulnerable succumbed to a day or two in sickbay. The advantages of “sickbay” were conversations among the community of invalids – and, chances to read and write in peace. For tourists, part of the marvelous history of Europe is centuries of art and architecture. But, Europe has a history of innovation in virtually every form of transportation, including hot air balloons. The picture below captures an interesting intersection of methods of transport. Our most unusual transportation mode was underground mine train. Although most of our travel was in small towns or picturesque countryside, France and Belgium played a vital role in the industrial revolution. Like significant parts of America, European regions form a “rust belt.” The mines, built when the reliance on coal as a source of fuel and power was vital, are now closed. 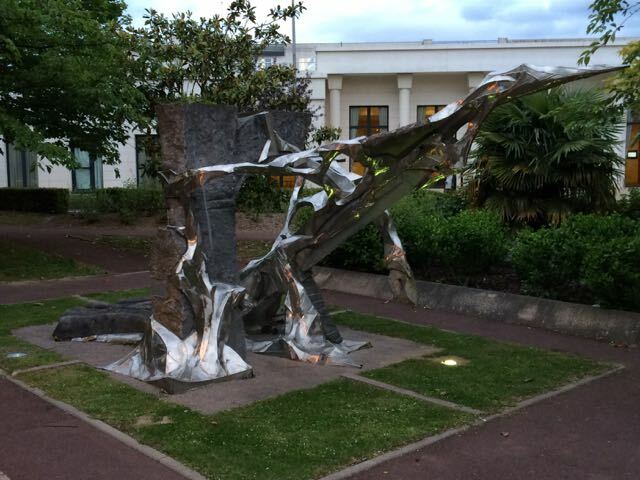 To understand fully the role played by this historic moment, there is a Mining History Centre, located at the heart of the coalfield, at Lewarde in the Nord département of France. As mankind proceeds into an increasingly post-industrial age, issues of employment and re-use of old facilities requires societal re-engineering. Multi-national perspectives seem invaluable. Fortified with the last stop at a French pâtisserie, we crossed into Belgium. As we approached Belgium, our guide explained that the once-significant passport crossing had been replaced with a mere sign to demarcate the border. “I was sure this was the place,” he said as he circled back. Several long loops. No sign. Gone. An absence can have great significance. 100 years after the Great War, the border between France and Belgium is unmarked. Our first city in Belgium was Tournai – with a lovely modern fountain amid a vast selection of food and Belgian beer within the old city square. Our barge was moored on the Scheldt (Escaut) river for the night. It had squeezed through the Pont des Trous, a vestige of medieval architecture, during our ride. It was in Tournai (or, a nearby town (delays in blogging can skew one’s memory)), that we encountered another type of delay. We were informed one evening that breakfast, always at 8:00 am sharp, was to begin at 8:30 am on the following day. “Why the delay?” a rider asked. “The bakery in this town does not open early enough to buy bread in time for the normal breakfast,” we were told. Of course, I thought: day-old bread – normal in the U.S. – is a sacrilege in France or Belgium. And, it will be that way after the last bike rider is gone. Into the Countryside: Simplicity of the Past. Not every magnificent Christian edifice has withstood the test of time. Impermanence is an aspect of all humanity’s endeavors. Occasionally, deterioration leaves behind evocative mysteries of a past place of worship. At St. Jean-aux-Bois & Compiègne, the remnants of a 12th Century church provided a lovely stopping point for lunch on a pastoral ride. Not far from the secular remains of an earlier millennium: a Roman amphitheater and bath. Of course, not every old church is in ruins. By celebrating simplicityThe Benedictine Order avoided some of the deterioration that seems to have resulted from the extravagant and ornate adorning of other religious buildings. 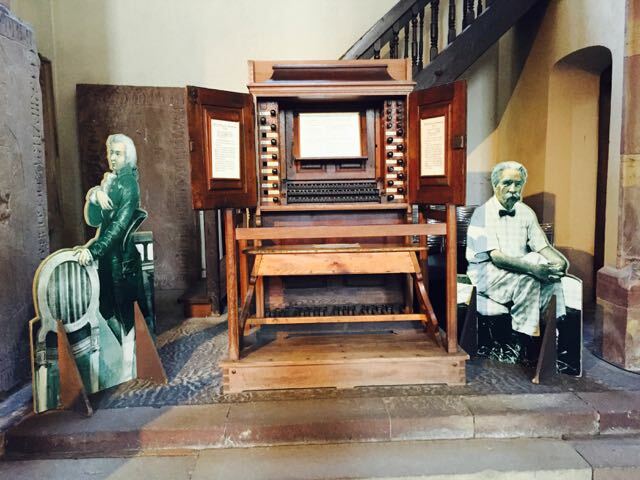 And, in keeping with the age of iTunes – a new organ for the current visitors to the ongoing place of worship. More Countryside: Riding into The Past Century. Now that I have more time and space to spread out, I seem have too many “local” commitments. However, I can still vividly recall the wonderful exploration of France & Belgium on a barge with delightful fellow bicycle riders. Living on a canal boat is a mixed blessing. A true blessing in that, despite a minuscule kitchen the food was Cordon Bleu quality. But, the daily schedule was rigorous – the activities of daily living were hard in a cabin that, although clean and neat – felt not much larger than a comparable space in a submarine. And, for those of us 6’ 4”, a “bathroom” that is 4’ X 4’ X 6’ 5” is rather cramped. (Smaller than my closet at home) And, a bed that is 6’ 4” is quite cramped. Consequently, it was hard to create and upload thoughtful comments without space and without consistent WiFi. Sadly, living in close quarters had other disadvantages. When the trip began, a few folks had a slight cold + cough. As I sketched this entry – 10 days into the trip – about 6 people had stopped riding due to illness. However, one of the advantages of a bike-and-barge journey is that rather than ride when sick, people can create a floating infirmary – and, heal. 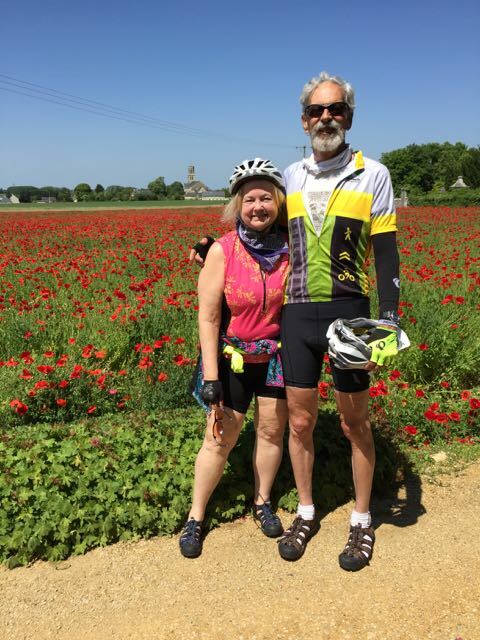 Our discomfort paled as our rides through rural France reminded us of the excruciating protracted horror that was the Great War, World War I. In the Forest of Compiègne we encountered the war memorial commemorating the signing of the armistice where World War I finally ended. The war memorial contains a reproduction of the rail car where the armistice was signed. And, artifacts that bring to mind the nature of the war. Known then as the “Great War,” World War I was also described as the “war to end all wars,” because many believed its high death toll and vast destruction would deter future fighting. This, of course, did not hold true. Because of resentment over the terms of the Treaty of Versailles, the National Socialist German Workers’ Party and its leader, Adolf Hitler, rose to power in Germany, seeking to avenge Germany’s defeat. After invading and defeating France in 1940, Hitler ordered that the French sign an armistice in the Compiegne Forest in the same rail car where the World War I armistice was signed. Travel in Europe can provide images of great beauty and emotions of great sadness. For me, no description of a BAC bike trip is complete without some mention of Navigation. Although each bike-and-barge tour has a default itinerary, adaptability is a natural component of all travel. 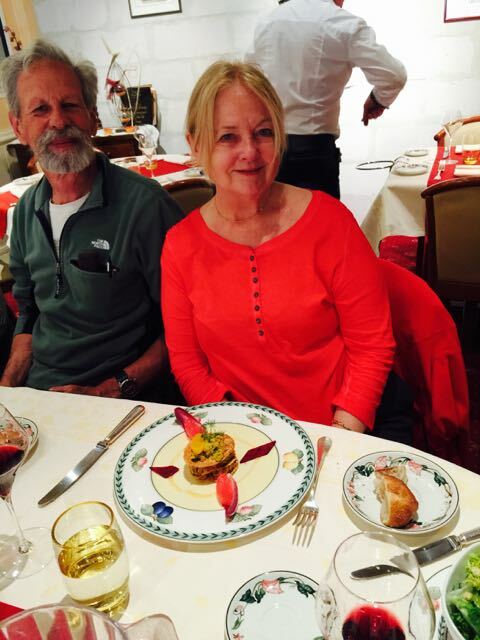 Our schedule had been imperfectly communicated to the captain of the Zwaantje (the thrill of working through an intermediary travel service) – and so, significant changes were made on the first night as we discussed where we would travel each day. Not possible. So, our trip included a staff of 6. Four folks to do the boat: a captain, his wife, an engineer, and a cook. Two folks to lead each ride. The ride leaders were graduate students who alternated as Ride Leader and Sweep. All 24 riders kept the same pace as we were guided on each day’s journey. That is – as BAC folks know – not the usual approach to a two-week ride. The advantage of pre-planned routes is independent navigation. 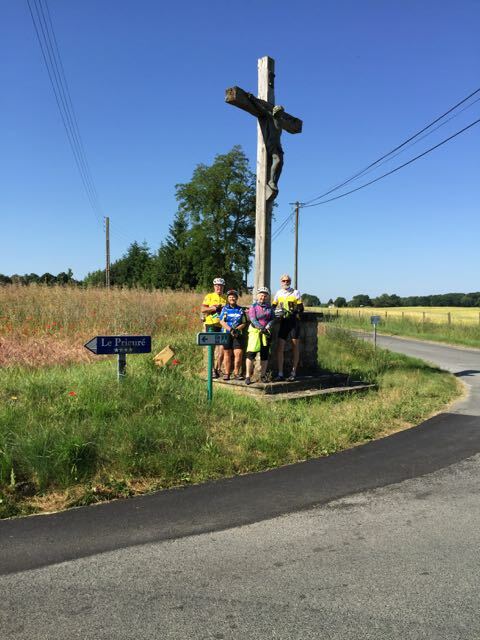 Often there are several groups based on speed: the quick ones; the moderate paced riders; and those travelers who want to stop and smell the flowers (and, take close-up pictures of the sunflowers that look like the ones that Vincent Van Gogh painted…). Not this trip. A single line of riders. Think Tour de France peloton traveling relatively slowly. A beguinage, from the French term béguinage, is an architectural complex which was created to house beguines: lay religious women who lived in community without taking vows or retiring from the world. Every journey provides unique perspectives and rewards. Below are memories – enhanced and modified by a return to a more quiet space. 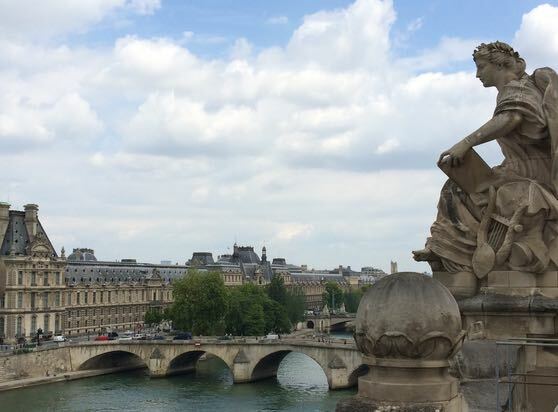 Paris – Sophistication and Simplicity. After an easy high-speed train ride from Amsterdam to Paris (passing Van Gogh’s fields of complex colors), we arrived at our home for the next two weeks: the Zwaantje. And, our twenty two fellow bike companions. We had a bit of time to configure each bike with our own pedals and saddle. And, a quick spin around the dock along the Seine – at the Quai du Bercy. “Yes,” I thought, “a sturdy Dutch bike.” “Not as light and nimble as my own bike, but should be OK.” Little did I understand how vital a sturdy bike would be on varied terrain: from cobblestones in historic cities to single-track paths through national forests. In an urban area that is constantly undergoing renewal, there are often Construction Zone road surfaces: gravel, potholes, narrow passageways… And, dogs. Consequently, a few minor falls, but no serious injuries. Yes, it is possible to bike past the Eiffel Tower. Yes, it is possible to bike past the corporate headquarters of Louis Vuitton. A short day of about 30 kilometers – and, back to our floating home before the serious rain began. A glass of wine and the camaraderie of shared experiences. 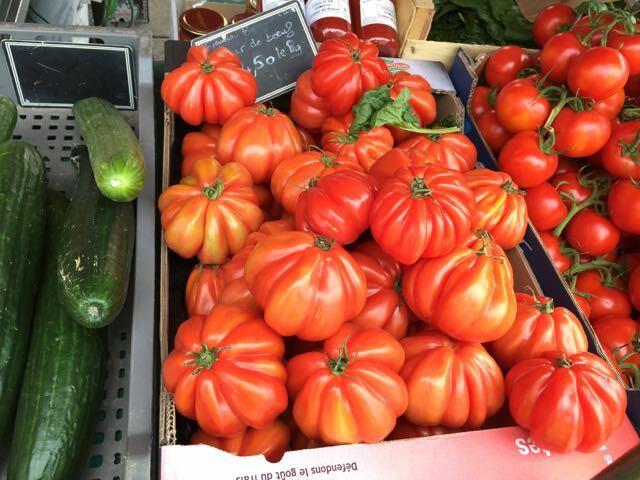 Beyond Paris – Simplicity and Extravagance. Part of a bike trip is, of course, riding bicycles. Part is an effort to understand and appreciate another part of the world and unique perspectives. Our next day began in Auvers-sur-Oise. It is the small French town where Vincent Van Gogh did his final paintings – where he formed his last perspectives. Note: bike folks do walk occasionally. So, before our ride, we walked up the hill from the river to a church and a cemetery. What would the church in the town where Van Gogh spent his last years look like to a camera? What would that same church near the asylum where Van Gogh spent his last years look like to an inspired artist? And, nearby – the resting place of Vincent Van Gogh and his brother. His poignant efforts to refine – constantly – his vision, his technique, and his perceptions enabled Van Gogh to leave a legacy that will inform the visual arts for millennia. His two dimensional world will inform my sense of experienced reality for the rest of my life. 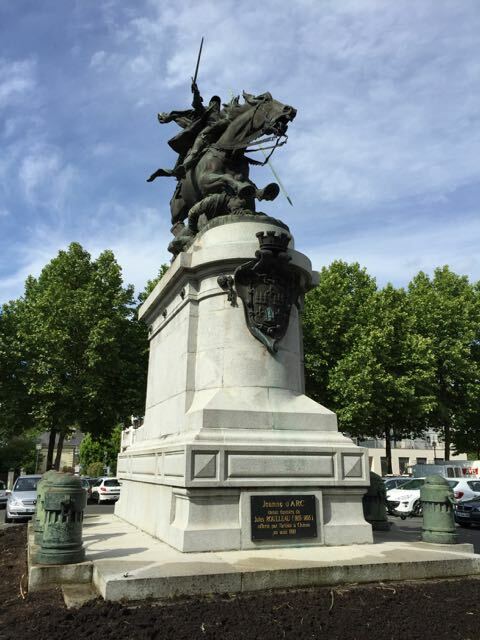 From artistic vision and the simplicity of a small town, we rode to a French marvel of vision and extravagance: the horse museum and the castle of Chantilly. From the library to the private chapel, a work of centuries of development (and, of course, re-development) has evolved from the 16th Century. Much of the vision is from Bourbon-Condé. Gracious architecture, elaborate gardens (it helps to hire the former gardener of Louis XIV), and a celebration of the skills and knowledge of the nobility: horsemanship. Not a bad spot to escape the tour’s most serious rain storm. A lunch time deluge. Time to admire a Renaissance library of great depth and breadth. Time to admire a personal chapel of great beauty and reverence. A few more kilometers and time for wine and stories. One of the thrills of international travel is jet lag: adjusting to a time zone shifted by 6 hours. One way to prepare for two weeks of bike rides (30 miles / day) without complete exhaustion is to start a few days early. And, if cheaper airline tickets are available in a nearby city (with high speed train travel to Paris) – why not depart a few days before and visit the most bike friendly city in the world: Amsterdam? And, what do to in Amsterdam but book a tour with MIKE’S BIKE TOURS? With only mild exhaustion – and, a slight chance for reasonable weather, off we went. A delightful time. One of the advantages of bicycle travel is that it is possible to have a delightful experience in an unknown city with unique traffic conventions – and, intermittent rain. 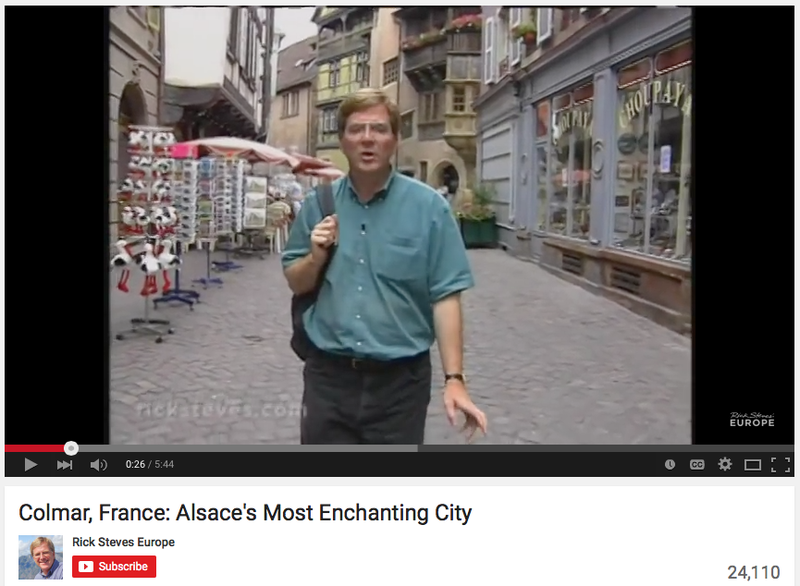 With an experienced tour guide, exploration becomes a street level view of a European city. Newness itself is inspirational: it helps us see traditional realities from a unique perspective. Of course, delightful people are vital. Our spirited tour guide (an Amsterdam native) with boundless energy, extensive knowledge of the city, a enchanting goth appearance, and an effusive sense of humor, was a catalyst for receptivity to a vibrant culture. 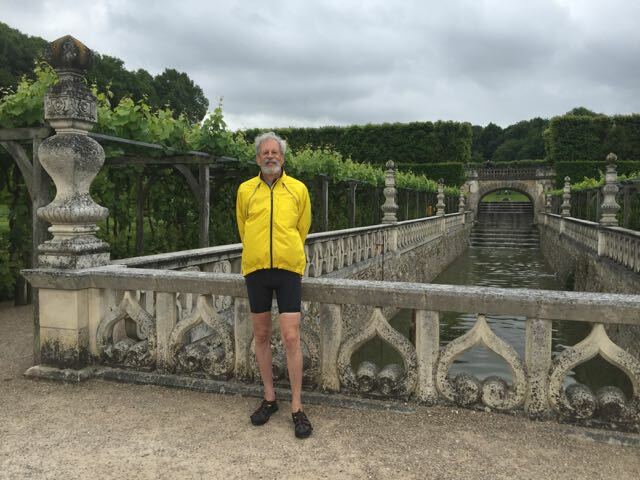 Part of the culture – and, a solution to intermittent rain – was to stop for a break near the end of the tour, as the drizzle increased to honest-to-goodness rain. At 11:30 am, I would usually pick coffee as a good beverage for a rain delay. But, in the Netherlands, real bikers opt for a Kopstootje, a shot of Genever (Dutch version of gin with juniper berries and spices), washed down with a glass of beer, and (to cushion the stomach) a hard-boiled egg. Amsterdam’s culture includes a population of 800,000+ people – and, 800,000+ bikes. Old, new, well cared for, rusty and worn… Single speed, old fashioned, new fangled… A cacophony of two-wheeled vehicles – and, adept riders. Only an adept rider could zip through complex traffic patterns while texting – and, survive. It helps to have a city designed and largely built before the age of the automobile. It helps to have real city planning. It helps to have land which is extremely valuable. Nonetheless, it is astonishing to see a vibrant city where the primary modes of transportation are public transport and bike. It would be a formidable stretch for most US cities to change from “bike as recreation” to “bicycle as transportation” – an integral part of getting to school and to work. Or, just to become a destination for happy tourists. Although It is wonderful to explore the world where bicycles are an integral aspect of life, European travel presents a world of experiences where art and history are always in evidence. So, for Joy and for me, the Anne Frank House and the Van Gogh Museum were essential destinations in Amsterdam. Compared to the Roman ruins visible from a bike in much of France, in contrast to the soaring gothic churches of a millennium ago, the horror of the Holocaust is recent. My father served in Europe in World War II. My work in Washington, DC enabled two visits to the US Holocaust Memorial Museum. The visceral experience of a single family – a sensitive young woman with ambition, insight and charm, and her father (the sole survivor of the concentration camps) – should penetrate the collective soul of all mankind. And, the enormity of the millions who died – all unique people with unique gifts to offer the world – should prevent future atrocities. We humans are capable of extremes of both compassion and destruction. The Anne Frank House images and significance – both extreme intolerance and sacrificial service – were a constant echo as our bike rides in France and Belgium unfolded during the next two weeks. Vincent Van Gogh’s visionary service to humanity was the underlying vision that I took from our visit to the Amsterdam museum that celebrates his extensive work. In his short life he experimented with a path into the clergy – and, he strenuously labored to find new techniques to portray the inner realities of his unique visual world. His collaborative work with other artists of his day showed a level of collaboration that seems frequent in the work of our best innovators. His transition into a mental institution did not diminish the flow of his evocative sketches and canvases. Only later, when we cycled past the fields that he painted, and when we visited his grave in Auvers-sur-Oise, would the majesty of his vision start to become fully evident. What is the best preparation for Yet Another Bicycle Adventure Club tour in Europe? Yes, after a hiatus of more than 24 months, we’re off to France for a 2 week bike-and-barge trip from Paris to Bruges. BAC trips are not spur-of-the-moment decisions. Often made a year in advance, they involve financial preparation (even with co-op financing, European travel is not inexpensive). Ultimately, travel is about discovery. And, so preparation involves more than improving physical strength and endurance. It requires knowledge of the territory ahead – and, conditioning for receptivity to new perspectives. An openness to new knowledge engendered by a new destination. How do we best ensure that we will return from our travels with an enhanced understanding of the world? the term has both ontological and ethical dimensions, and refers to a mode of listening and “normative response” to demands arising outside the self, as well as “a way by which we might become more attuned to our pre-reflective understanding of the world, to our inherited ontologies,” thereby generating non-instrumental possibilities for social change and self-transformation. Perhaps, when we travel, we should just travel. But we educated folks need effective techniques to open our inner eyes. Even if our physical eyes are dimmed by the years required to earn a Medicare card. And, as luck would have it, my home town was conducting its annual European-stye fete: The Decatur Book Festival. To make this adventure work, I would have to ride my bike to the Book Festival. Like the bike-and-barge configuration, I would need a bike with at least 1 pannier, plus a small backpack for: raincoat (wet weather is universal); a camera (not just a smartphone with a lens); and a notebook (people with Medicare cards have fallible memories). The bike ride would elevate my normal heart rate (much easier to drive to Decatur on a typical day). The camera would force a new attentiveness on the visual world that I think I know well. The notebook would remind me that verbal descriptions existed before the age of the selfie. As a “Decatur-ish” person for 30+ years, I enjoy this Atlanta suburb with its rich diversity. Yes, Atlanta is quite diverse for a Southern city, but Decatur has a reputation as the Most Diverse city in the U.S. The fact that it hosts the largest independent book festival in the country gives some indication. But, how to capture this irreverent love of diversity for a Blog? Anyway, the city seemed much more crowded than usual – both pets and people. It was wonderful to see so many happy people in the shadow of the prominent 19th Century building in the center of the square: the Dekalb County Courthouse. The building was constructed in 1898, its predecessor destroyed in a fire. It was a pivotal point in Sherman’s capture of Atlanta in the American Civil War. Receptivity resonates with font-of-mind context. Within the September 2017 American political frame of reference – the horror of Charlottesville, VA (and, President Trump’s functional condoning of racism) – it was hard not to feel a strange contrast to the joyful curiosity for the best new literature on display in Decatur. In 1909, as other cities of the former Confederate States of America had done, Decatur added a monument in front of the Courthouse. Not Robert E. Lee on horseback, not Jefferson Davis… Just an obelisk to commemorate The War… It could reference a lost way of life – an inhumane economic system. But, it simply commemorates the courage of the soldiers of the Confederacy. What should I take away from Decatur with my “new eyes?” The early 20th century effort to memorialize white supremacy? The current collegial celebration of the arts – literature and music? Time to head off to another talk by another author, I thought. Understanding requires both an open mind – and, some time for reflection. Perhaps, in another 50 years, today’s young Decatur folks can look back with more insight. They already hear a different drummer. Overview and Links to a Beginning. Although this blog is about travel by bicycle, its central focus is the experience of visiting new places, encountering new people, and trying to integrate new awareness with established perspectives. 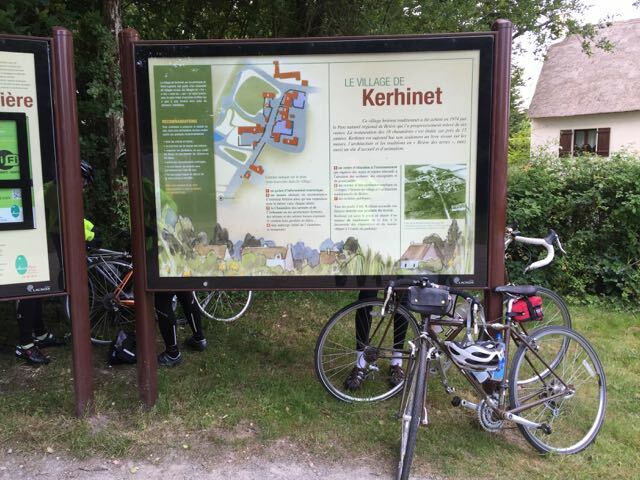 This post and the ‘n’ previous posts are primarily reflections from a two-week 2015 Bicycle Adventure Club trip in the Loire Valley. 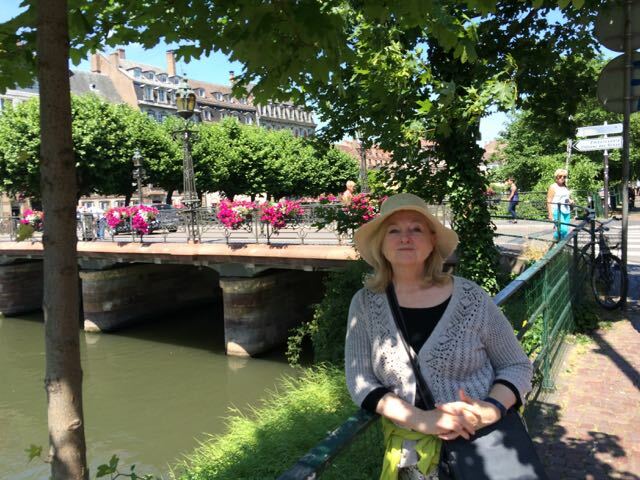 A trip bounded by extra weeks in France: Paris and Alsace-Lorraine. However, this trip was bounded not merely by travel and its resulting insights, but by tragedy. It became a voyage in the context of a deeper understanding of personal histories. Much of Europe is sensible only as a collection of histories. The intertwined cultures, languages, religions, and intermittent wars are ubiquitous. War and needless tragedy are universal themes of life, crossing borders and generations. 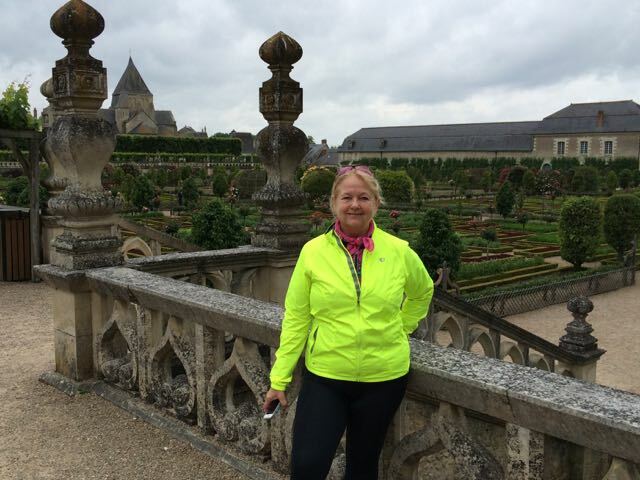 Because this trip began in heartbreak, it was impossible to make this site a genuine Blog: a daily record for friends to follow as a bicycle journey unfolded along the Garden of France, filled with vineyards and grand châteaux. So, it has become a remembrance, best read from start to finish. If you are just arriving here, I suggest that you start at the first entry for 2015: Preparation – a New Journey – dated 15 May. Then, read Next Post; Next Post; Next Post; etc. until you arrive here, again. Then, continue with This Post: the last few days of travel: an effort to assimilate new insights into established understanding. In the morning, even with enough coffee, the usually wonderful airport signage seems ambiguous – hard to find the Hertz booth. And, the usually wonderful Hertz efficiency is replaced by an understaffed counter, compounded by the agent‘s futile search by for the keys to my car. Ah, well: an apologetic agent. First: Le UpGrade – a larger car. Second a map! This may not seem like a big deal. But, it was. Hertz in Paris does not have maps. But, the resourceful agent “borrowed” one from the Europcar counter nearby. The usually wonderful road signage also turns ambiguous – hard to see that some exits go to roundabouts where secondary roads are to be found. Hooray for the AT&T Europe package and Siri. And, two people: driver + map / iPhone navigator. Double hooray for the AT&T Europe package and Siri when we reach Colmar: one-way, convoluted, narrow streets, with road construction. 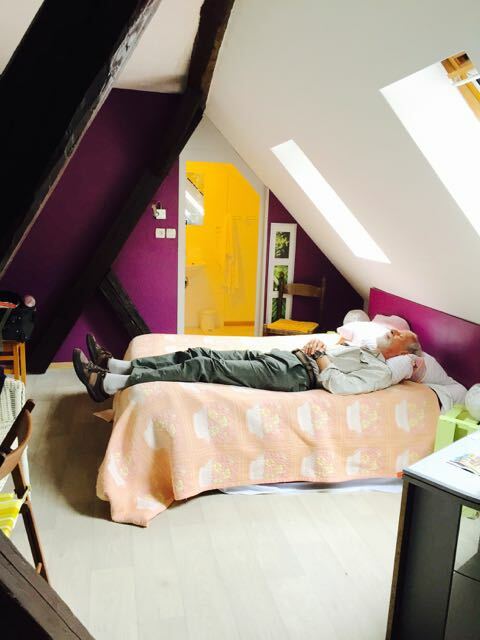 A truly lovely Hansel & Gretel B&B: Domaine Martin JUND. We chat in the courtyard over a glass of wine with a charming couple from Australia doing this year’s European travel. And, we find a delightful restaurant up the street with traditional Alsatian offerings. Lovely breakfast with a couple from Winnipeg, Canada. Shared stories of travel. A slow, charming walk through the old city center – punctuated by a stop at the Unterlinden Museum with artwork of exquisite detail. An awed hush seemed to envelop all the visitors. Even in a secular age, the monumental depiction of suffering and compassion is evocative. The artists who portrayed the stories of Scripture had insight into more than aesthetics & technique. Equally evocative is the The Église Saint-Martin – the main cathedral of Colmar – inspired by the Saint Martin of the Loire Valley where we spent the previous two weeks biking. The impact of his life of pervasive devotion inspired many Christians throughout Europe. Whatever the overall judgment of Christianity as an organized religion, its ability to inspire extreme devotion and artistic creativity of the highest order remains a profound testimony to the power of the Church. After a day of wandering, first impression of Colmar: …charming Germanic flavor of an Old City – now verging on nouveau Disney-esque. Complete with Little Venice on the canal near the covered market. Worth a revisit when the market is open. The usually enthusiastic morning almost returns – the bike ride plague abates. An expedition: local free parking. A walking tour to scout out one-way streets. An unexpected discovery: the local synagogue. The ‘nth’ reminder of the tension between Christianity and Judaism. Back to the car for a short drive and a slot in one of the few remaining spaces in the public lot. Again, hooray for pre-High-Season. Then, Wine Tasting with Sebastian – son of the owner – who recounts replanting of vineyards after WW II. And, relatively continuous occupation of the 1604 building for many generations back… Built originally as the town Post Office, its attic beams are still strong. And, a short chat with another couple staying in the same winemaking site/B&B: visitors from Macau. This is, indeed, the 21st Century. Oh, yes. Wine Tasting with Sebastian: 4 unique wines – fascinating personal insights into growing (brother Martin’s domain) and creating (Sebastian’s domain) local wines. Not real work – just a way to live in harmony with history and grapes. Time to try a recommended restaurant back in Petite Venice. Closed. So, a charming simple restaurant on the river! Kidneys for me; trout for Joy – ambience for both. And, folks at the next table from Argentina – not Spain, as suspected. 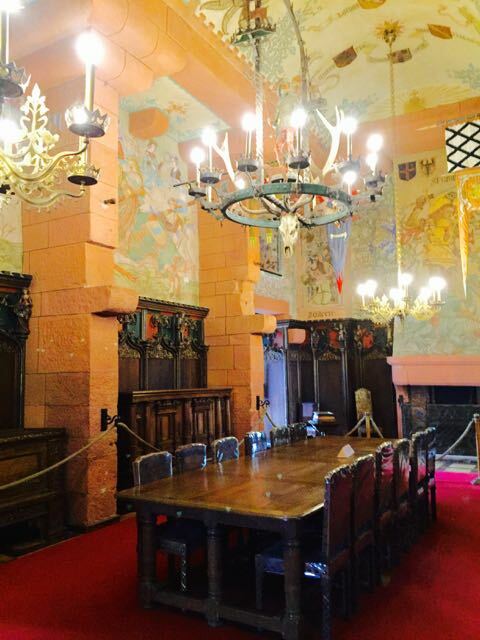 A gentle morning with time to plan: a visit to the Haut-Koenigsbourg castle. If we were “on a tour,” this would have been the first event of several activities of the day. But, we are not on a tour; we are in plan / experience / reorient / reflect / chat / wander mode… The intersection of planning and spontaneity. So, in combination with the research from the night before, we hike to our car in the public lot near the river; get driving directions from Siri (did we say enough about the value of the iPhone’s international GPS function? 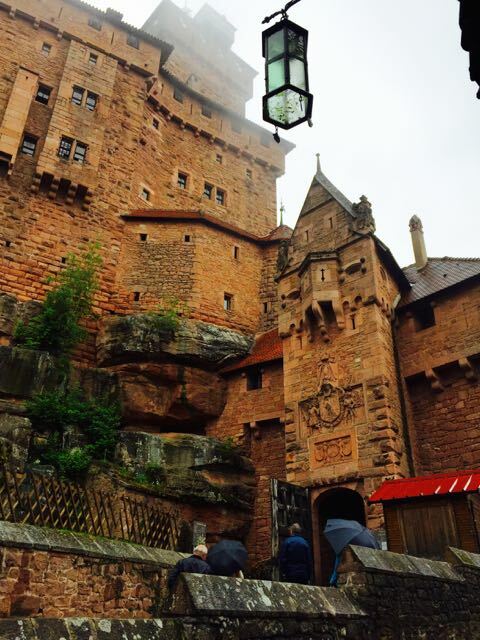 ); drive to the town of Sélestat for the shuttle bus to the castle. We are rewarded with another astonishing dive into 14 centuries of European history (often quite confusing) and profound astonishment at the perseverance of people who could build an almost (!) impregnable fortress on the top of a small mountain. By the time we are finished touring the castle, there is a wait for the returning shuttle bus. Why not have a quiche and salad in the clouds? Too cloudy / foggy / rainy to wander outside and take pictures of the valley below. And, time to think about not only the history of the castle: its construction from ~700 to 1400 and its destruction (!) – but, also its reconstruction at the start of the 20th Century by Wilhelm II to demonstrate the value of the valor of Prussian knights. Destruction Note: Gun powder changed the role of castles – a premonition of the Great War. Almost as interesting as Franz Joseph I of Austria – whose history we encountered in our visit to Vienna in 2014. Both of these rulers with robust egos have had a great influence on World War I. And, the reverberations still haunt as we remember the last 100 years. 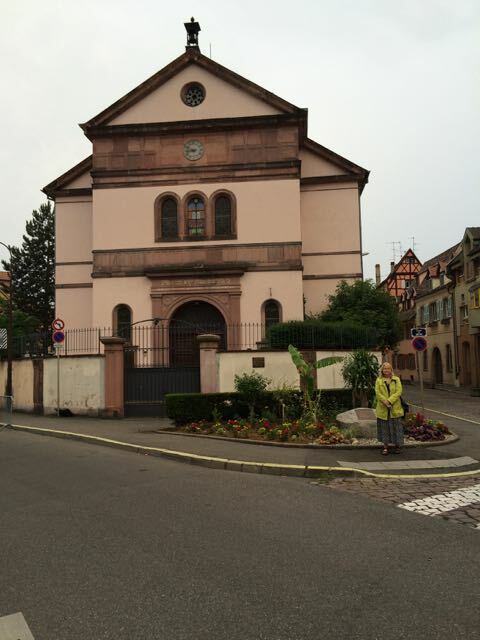 Back in Colmar, as we walk from the public city parking lot back to our hotel, the beautiful synagogue is now guarded by soldiers! Je Suis Charlie? 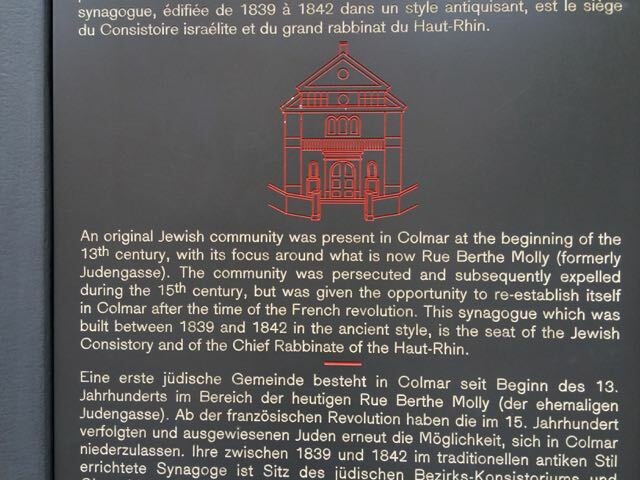 An awareness of the history of Europe is never far from sight, and History of the Jews in Alsace (Wikipedia) is complex. A gentle (earlier) morning. 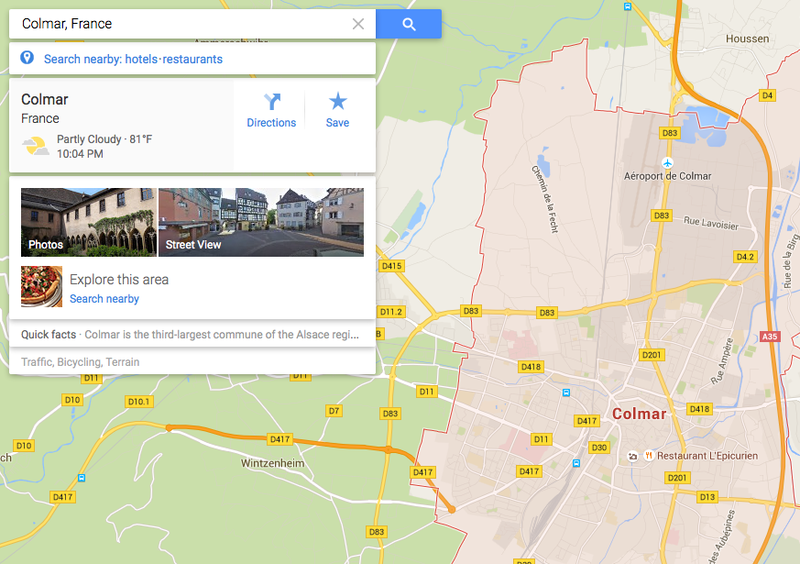 Off to the train station… Delays from new sights in Colmar. Therefore, just miss the train… Time for coffee and chatter as we wait for the next one. 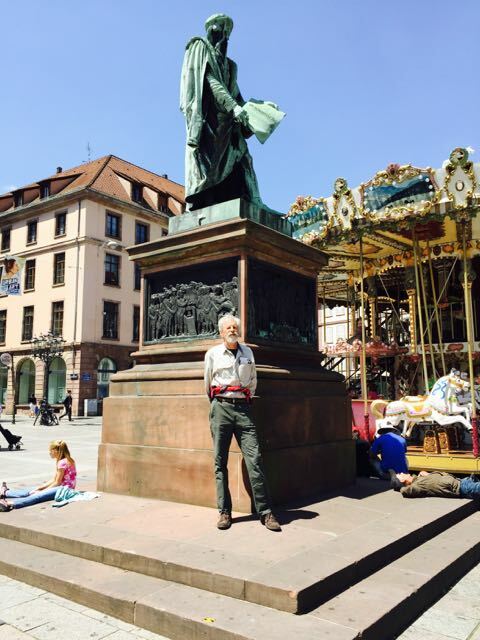 A chaotic start to the “walking tour” – churches, the river, the Cathedral! – lunch at the river, Albert Switzer’s home… Mozart’s organ… yet another church… Indeed, another city of river walks and charm. Happy senses as Strasbourg’s inner city unfolds; tired feet as we wander back to the Gare, the railway home. 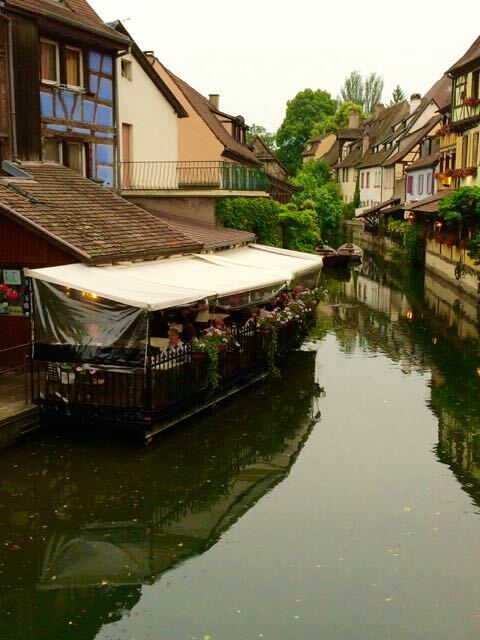 Dinner at our “favorite” restaurant in Colmar, then home to rest & pack… in our 1604 Hansel and Gretel loft. All journeys end. But, understanding travel experiences, like celebrating inspirational events and grieving tragic incidents of the past, can take time. The energies of creation, so strongly etched in Europe’s 3-dimensional space by the great cathedrals, castles, and chateaux; the paintings and sculptures of so many extraordinary artists; the memories of so many people whose lives ended too soon. It connected me to the start of my journey – some sadness for a life that ended too soon & much joy for a life lived to its fullest. And, a reminder that leaving home is a vital part of any contribution to the progress of civilization – in any age – in any circumstance. The value of both our contributions and our insights should exceed the effort of the journey. My symptoms of the variant plague continue to diminish, slightly. Yeah. By the time breakfast is done, suitcases packed and loaded in the van – the rain is gone. Yeah, again. More brilliant navigation (good cue sheets, Google maps, iPhones, savvy experience… Maybe some help from above…). Angers has an apparent successful and eclectic approach to business: we stay at a Best Western Hotel (but, originally French design) – across from the Mac Café. 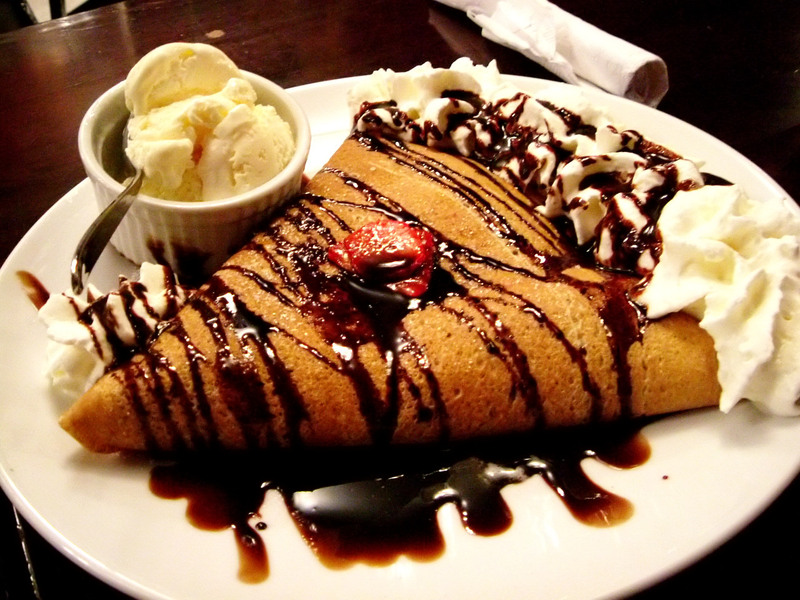 But, wonderful crepe for lunch (not at Mac Café). My symptoms of the variant plague continue to diminish. Yeah. And, a rest day is just what I need. 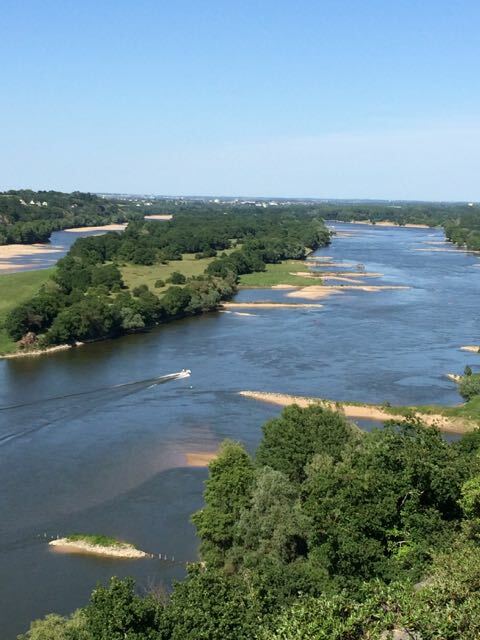 A chance to wander about Champtoceaux and enjoy yet another view of the Loire valley. 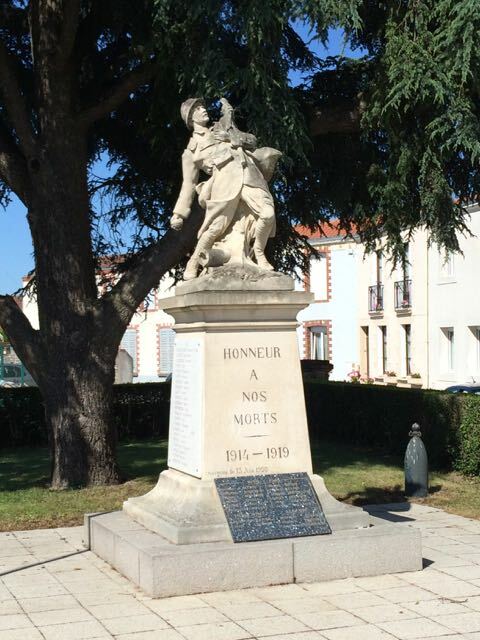 As in almost every town, there is some monument /sculpture / plaque to the soldiers of France who gave their lives in World War I. In America, it was called Vietnam; in France, it’s IndoChina. My symptoms of the variant plague continue to diminish, slowly. I think. 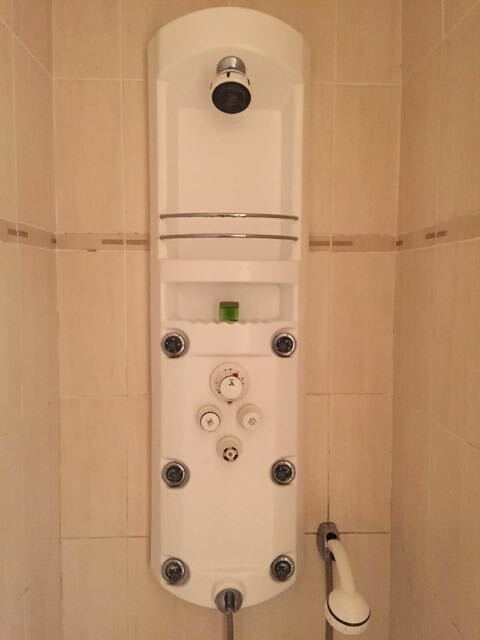 Arrive at hotel with most great shower… Can you imagine how many creative approaches there are to “How To Design a Shower” in a nation where aesthetics trump functionality? Remember, a new hotel almost every night. Great “briefing” in the hotel courtyard before dinner – how to be (and, why to be) a Ride Leader. Echoes of Greenleaf’s “Servant Leadership.” Hosting people in one’s home… Helping others to experience a great ride. My symptoms of the variant plague continue to diminish, but not if I ride hard on long days. Today is a long one, and I’m very tired. I get an interesting insight into the logistics behind the scenes as we discuss his role in supporting our ride. We have two languages in common: English and Spanish. Spanish is my second language and his third. We try a few sentences in Spanish. Not too bad. For me, belter than French. Soon, we have covered enough miles to need coffee. Since Malik is French, he knows to stop in the bar on the main square of a small town: espresso for a reasonable price. (Often in France, wine is cheaper than coffee. A fact brought to light as two of the local town folk wander in for a shot of white wine at 10:30 am.) As Malik and I stand up to leave, the woman, who has now moved beyond her first glass of the day, announces (in French): “Damn, you’re tall…” Probably, her first American tourist. 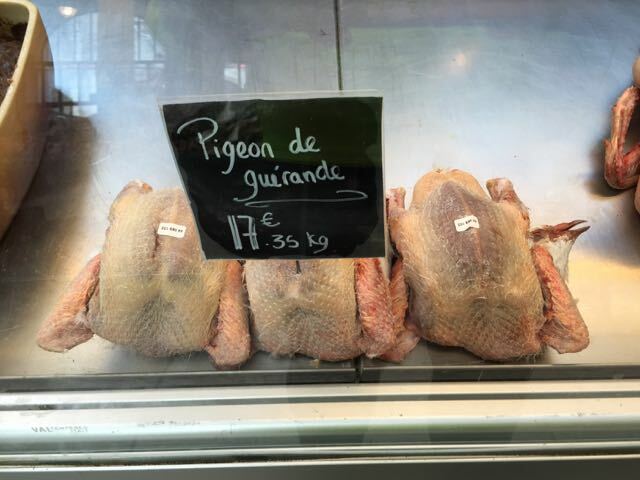 We are, indeed, in rural France. When we reach the day’s hotel, I watch as Malik engages the hotel staff. He morphs from a van driver to a soft-spoken diplomat: special accommodations for the woman whose bad Achilles tendon requires a first floor room; a vegetarian meal for a sensitive member of the group… I use my low-level diplomatic skills to convince him to let me help unload the van. Then, he carries each person’s luggage to the correct room. Since we are way ahead of the bike riders, I wander into town on foot. Despite my poor French, and without my French-speaking wife, I manage a lovely lunch in local restaurant. And, since it is still a long day for the riders, I have time to sit inside the relatively simple local Catholic Cathedral. Alone in a sunlight filled stone enclave, I light a candle for my Irish-Catholic father and many others who have influenced my life. I watch another candle lighter: a middle-aged woman with a young child. In what seems a habitual way, she approaches the supply of new candles, drops her € 0.50 into the coin receptacle, places the lit candle in its stand, and pauses. She then slowly exits with the small girl still holding her hand. Even without a bike, travel can be illuminating. My plague symptoms diminish, and, since this is a short (31 km) last day, OK to try. 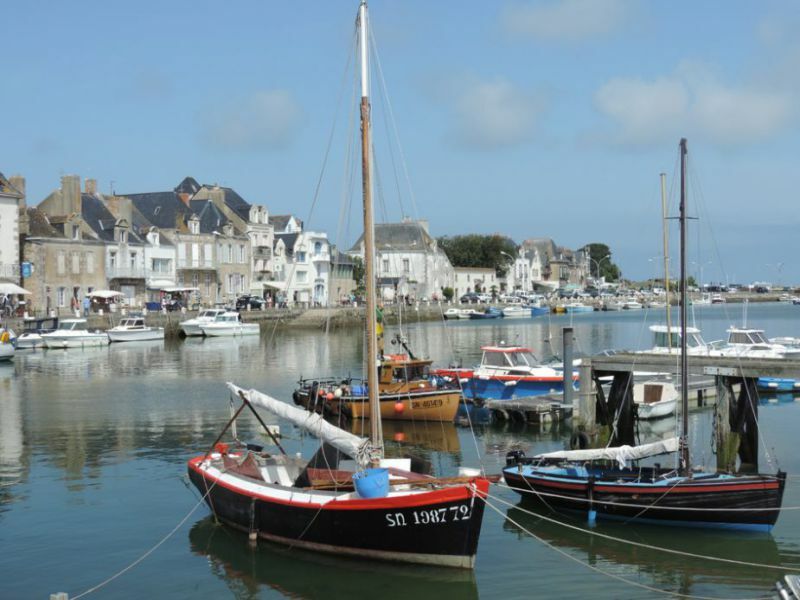 And, four possible stops along the way: Kerhinet, a village fully restored by the Brière Regional Nature Park, (old houses showing thatched roof construction); the Medieval Mall (oops, old city) of Guérande; the Salt Museum (this is the part of France where much salt is produced); and a German bunker from WW II. An easy day of riding – despite very gusty winds. At worst, crosswinds that encourage concentration; at best, a gentle push towards the beach at Le Croisic. A Very Slow start with a walk to town. Glad it’s not the peak of tourist season. 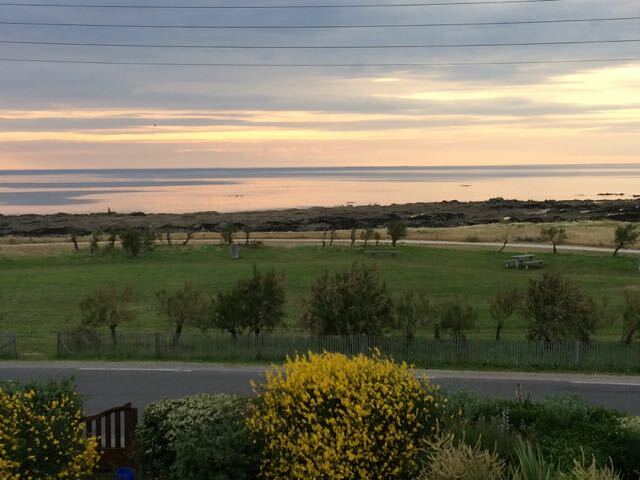 Buy lunch for a picnic on the veranda of our hotel, overlooking the bay! Yes, we are on the Atlantic! An early exit (pulling away from the hotel at 7:30 am) in a futile attempt to avoid the afternoon “rush hour” in Paris. But, the weather clears, and we have a lovely view of an alternate path between the coast of France and its capital as we watch farmland appear and vanish along a major highway. 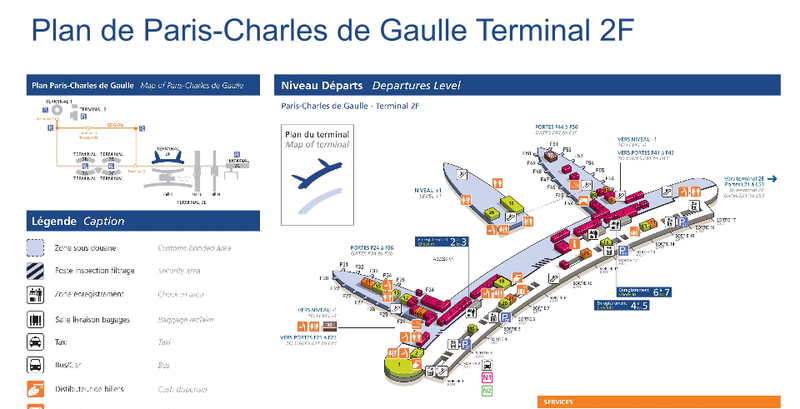 At Charles de Gaulle, we are back in logistics mode: check in for us requires a trip via hotel shuttle bus to Baggage du Monde in Terminal 2 with our bikes for another week of storage. And, sad farewells to an extraordinary band of fellow bike riders. Although this blog is about travel by bicycle, in a sense, it is about meeting new people, visiting new places, and trying to balance actual experience with recorded thoughts and observations. Since I do not have a film crew, and – since my companions (especially my wife, Joy), are so delightful, it has been hard to find time and coherence for a bit of blogging. A reasonable start for a day of non-bike travel to prepare for bike travel… Pack, check out, and – finally – go. Of course, as happens in some subway lines, the track forks: This train to This end point; the Other train to the Other end point. Therefore, exit train at first station; wait for next train to good ol’ Charles de Gaulle Airport. Easy. Back to Charles de Gaulle Airport for bikes. pause and eat lunch… Shuttle again to correct Novotel hotel with two 70-pound bike boxes. Great fun transporting bike boxes on an airport shuttle bus. Most of an entire day to move all belongings to a hotel a few miles away. Just as “Southern American English” has extra verb tenses (Present Preparatory: “fixin’ to do that next week…” And, Future Indefinite: “might could get to that real soon…”) – travel has special time sequences. We have a moment to appreciate a 4 Star Hotel – and, attend a meeting in the lobby at 6:30 to do a first food event with ½ of the bike group. Late, of course, with animated conversations about world politics ($ + power + alliances + resources…) and realpolitik. Anecdotes of BAC trips to Vietnam, Australia & China! We have a reasonable start from the posh Novotel… Pack, check out, go on bus with all stuff. 3+ hours to by bus to Tours. There we assemble our bikes! Rather than repeat comments about how to move a bicycle across the Atlantic ocean as if it were mere baggage, I suggest a visit to an earlier post: Leaving for Europe – May 2012. 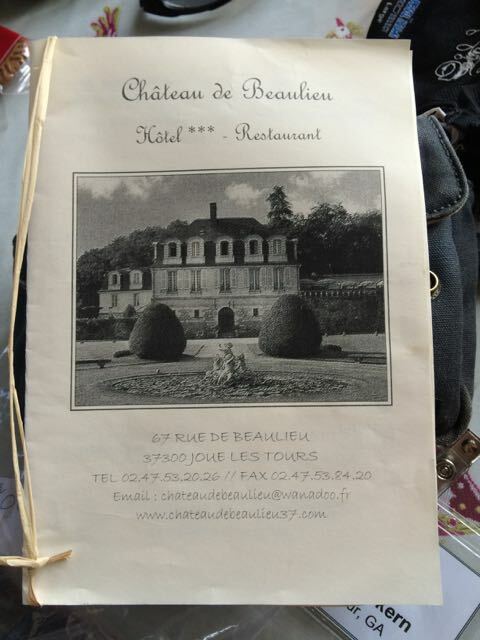 Dinner with gang… lovely Chateau, I guess! 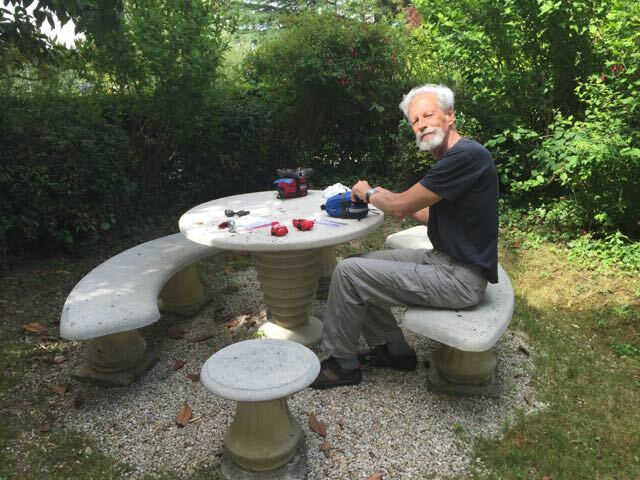 But, if you read the May 2012 post, you may realize that trying to assemble two bicycles in a patch of grass in a courtyard as the sun sinks behind the trees, takes 110% of one’s energy. Not much left to admire a lovely view. 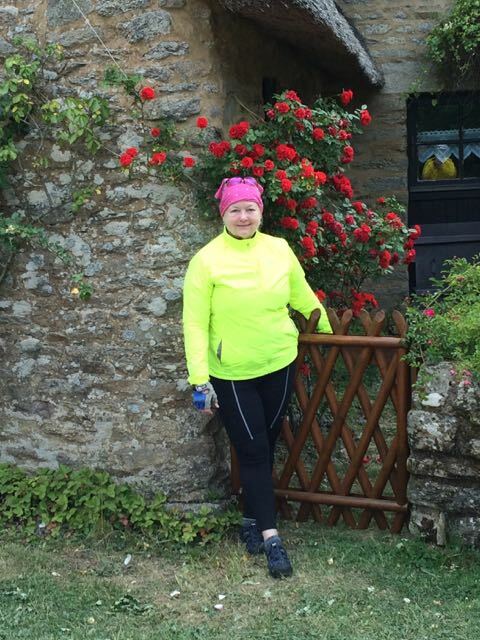 A reasonable start… a 40 km ride to Azay-le-Rideau. 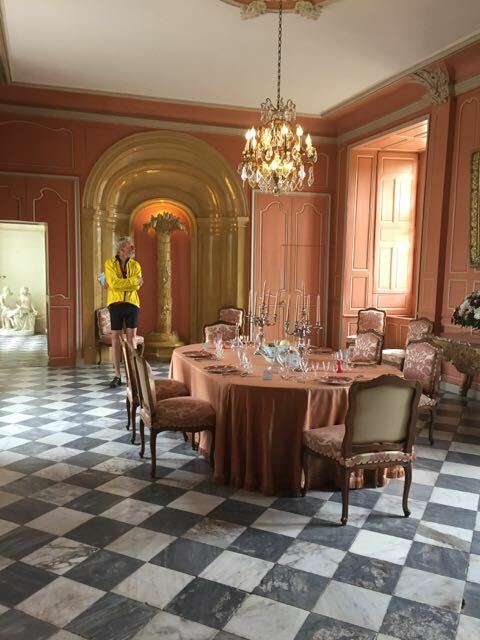 In Paris, museums are obligatory; on the road, stops at Chateaux are quite natural. so, a stop at a classic chateau; Villandry. Exquisite gardens, extraordinary beauty. Lunch on the road, with conversations & enthusiasm. 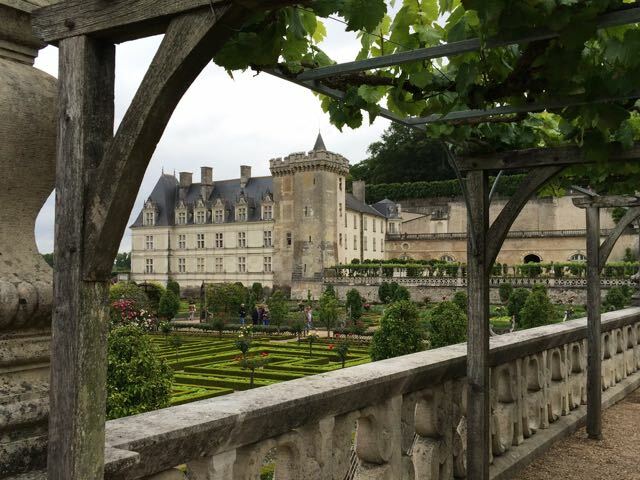 We wander Azay-le-Rideau for another chateau… in renovation state. Oh, well. 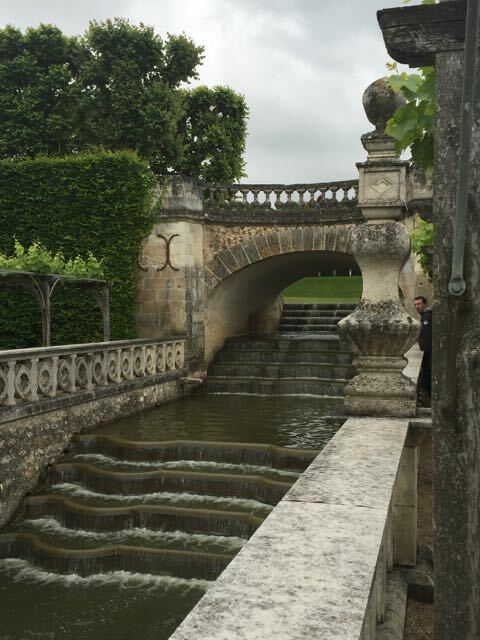 Some of us are still vibrating from Villandry. Dinner: delightful resonant connections with fellow travelers. Some greater compatibility than previous trips. More mellow? More aware of the good fortune of people to see the world from 2 wheels with rapport with others? I’m not sure – but at moments like this, travel seems a blessing. This might have been posted earlier, bad Internet connections can happen even in lovely hotels. And, even blessed travel can create exhaustion. 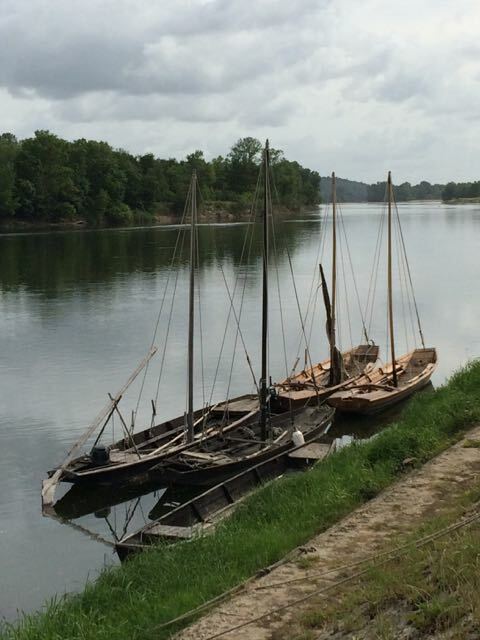 Another reasonable start… a 36 km ride to Chinon. Unfortunately, enough time for an early check of email: Secretary of State John Kerry Cuts Europe Trip Short After Bike Crash (in France!). 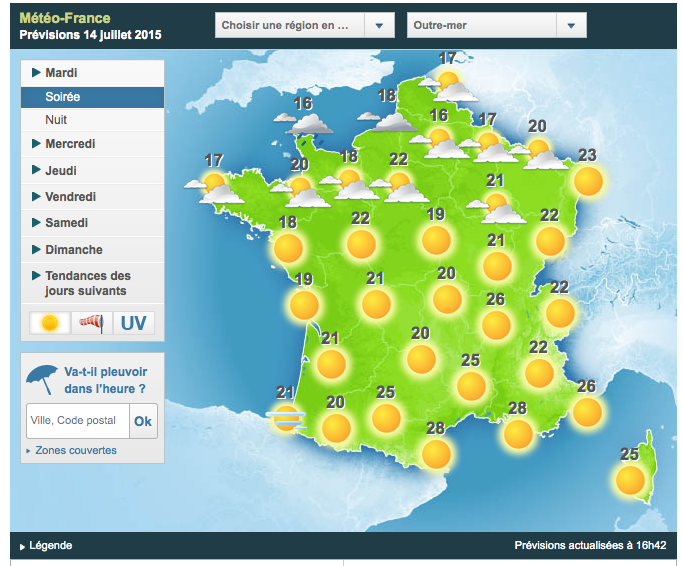 Better weather – no rain.. Easy distance. Therefore stop for coffee (almost everyone, at the logical coffee shop on the road!). And, time for a leisurely stop for lunch. Easy navigation with Harold and Judy (helps to be doing this tour for the second time). Lovely hotel (Hotel Diderot) with exquisite charm for 2 nights. Loop ride(s) tomorrow. A slow start… The specialty of the Hotel Diderot is home-made jams & jellies. Guess what breakfast is like? So, rather than loop rides, we opt for a gentle walk to the center of Chinon. A free ride in the town elevator up the cliff to the Fortress of Chinon. And, an increasing appreciation for both François Rabelais and Joan of Arc, the patron saints of Chinon. A stop at the Wine Museum of Chinon. (Did we mention that we are starting to make wine in Decatur, GA? Wine Workshop) The museum turns out to be the Animated Wine Museum. Imagine a Walt Disney of Chinon with not much money, but great enthusiasm for the history of wine in the Loire Valley… Animated figures in the sub-basement of a charming restaurant / bakery. Back to rest feet before the formal, narrated walking tour of Chinon. And, wine tasting. And, overwhelming dinner. As Lance Armstrong said: “It’s not about the bike.” For BAC folk, life off the bike is OK. Especially within a group of fellow travelers whose health deteriorates. Two of the 24 members in the group were coughing on day 1. Hmmmmm. One of those recovered quickly; the other seems to have contracted some variant of the plague. 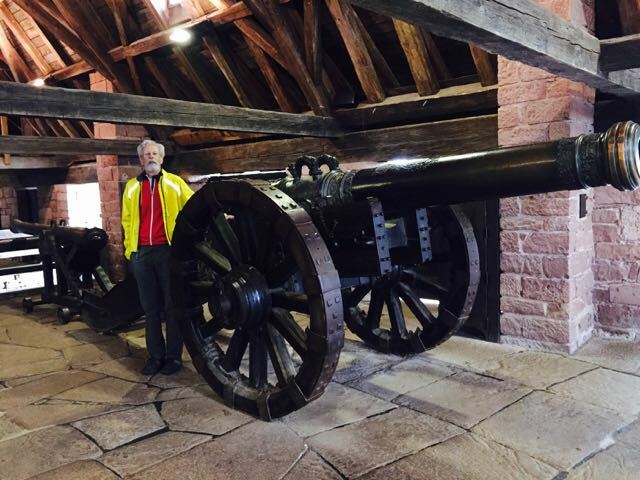 Now several of us are ill, and were it not for a rental cars for non-bike travel, this group would seem less like a victorious Tour de France team – rather, the rag-tag army of Napoleon returning from inglorious defeat in Russia. 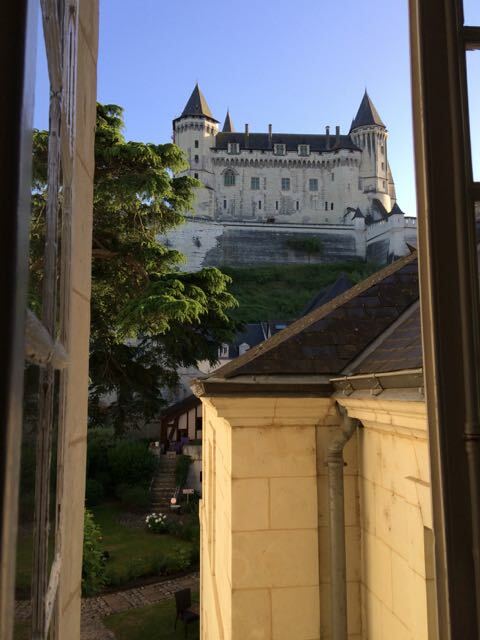 I managed the short 37 km to Saumur (including the 15% descent into town), and was delighted to rest in an extraordinarily beautiful room with a view of the local Chateau from the window. And, to discover, down a short flight of steps, the most anatomically correct bathtub in the world. Despite my variant of the plague, I managed the short ride (33 km) from Saumur to Brissac-Quince. Hooray. No longer cold in the morning; no longer slight moments of rain. Now the reverse: bright skies and hot afternoon temperatures – 88 degrees. Another superb bit of navigation by Harold, one of our fellow riders. Illness is not so bad without the worry of getting lost. And, almost time to post a blog entry. 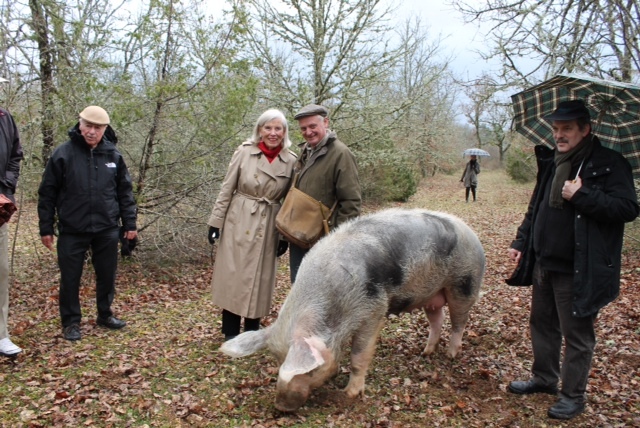 However, to use the sort of politically incorrect humor that results from frustration, finding “free time” on an organized bike tour and a solid internet connection at the same moment, makes the task of a blind pig finding a truffle seem easy.